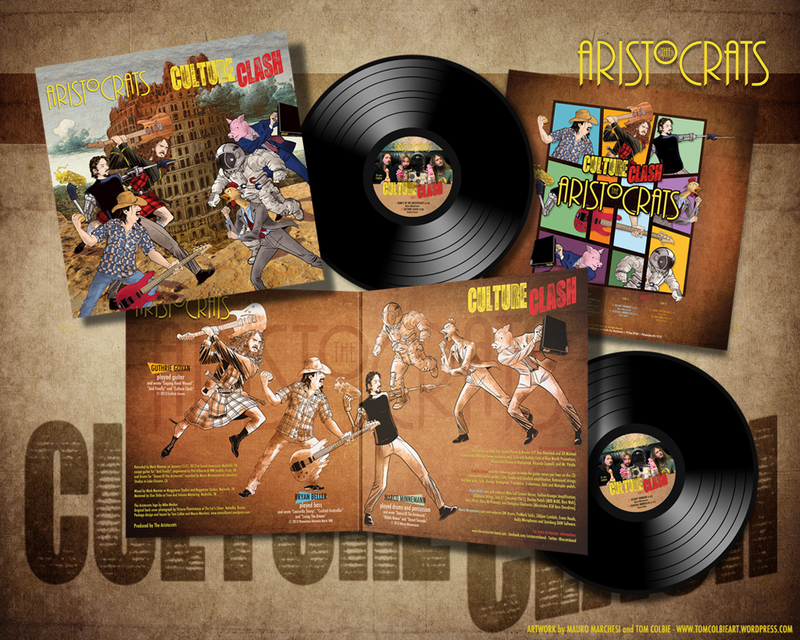 The Aristocrats’ Double-Vinyl Limited Edition Of “Culture Clash” Is Out NOW! The Aristocrats’ very special limited edition double-vinyl version of “Culture Clash” is out and shipping NOW! It’s a limited pressing of 1000 on 180-gram audiophile virgin vinyl, packaged in a deluxe gatefold polybagged jacket. It contains artwork exclusive to the packaging. And the folks who pre-ordered are getting it in the mail as we speak. We have less than 60 left in our own webstore (which is, of course, the best place to get it!). Just click here to go to the Aristocrats website and order now. And while you’re at it, be sure to check the Calendar page for the latest updates on the 2014 Aristocrats tours in the West U.S., Mexico and Europe. Thus concludes one of the lamest, shortest blog posts I’ve ever had the gall to hit “publish” on after writing. Talk about mailing it in! Then again, it is 4:46 in the morning. Protip: Writing after 4:00am does not always produce that late night magic. I do promise that the vinyl sounds good. That part was *not* mailed in, at least. Greetings from the Joe Satriani U.S. Tour, currently in progress. While this massive machine moves across America, I’ve got some very special Aristocratic news for you: We’re proud to announce that we’re selling a very special limited edition double-vinyl version of “Culture Clash”. It’s a limited pressing of 1000 on 180-gram audiophile virgin vinyl, packaged in a deluxe gatefold polybagged jacket. It contains artwork exclusive to the packaging, and the very few folks who’ve heard the vinyl test pressings say it sounds huge. We’re pre-selling 200 of these through our online Aristo-store. Click here to pre-order now. Release date is September 24. If you don’t manage to get one directly from us (which you should, hint hint, until they run out), you can get one from our vinyl partners Hostile City Distribution, by clicking here. In other news, if you’ve been paying attention to the Calendar page, you’ve seen some 2014 dates suddenly pop up. If you haven’t noticed, now might be a good time to check out the latest over there. Remember, these tours are still being booked and are far from complete, so don’t panic if you don’t see your city or country on there. There’s more to come. Meanwhile, if you’re in Florida or on the east coast, the Satriani machine is headed your way. Hope to see you out there soon.